Old Mill Run Park is located on 65 acres in Boone County, Sugar Creek Township. The property was originally farm ground that had been sold to a gravel mining company. The mining of stone left the property with 2 "lakes". 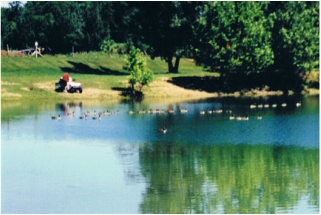 In 1972 John & Phyllis Barker started construction of the gravel quarry and in 1973 opened Old Mill Run Park. In 1980 The park was sold to Jerry & Becky Hill who maintained the park until May of 1998 when the park was purchased by its current owner/operators Ralph & Sandy Christman of Otterbein, Indiana. The Christman Family has updated and renovated many of the parks amenities making it a beautiful place to bring your family. For an extra added piece of mind the park is frequently surveyed by an in-park security officer and is also now a gated park requiring key cards to enter the park without park permission. All of this to maintain a safe and peaceful stay for all of our campers. The 2 original lakes are now stocked with catfish once a year with no swimming or boating allowed in either one to allow for a quiet, relaxing afternoon or evening of fishing. So whether you prefer to fish, swim, or just camp and enjoy the park activities make us your vacation destination for the year.